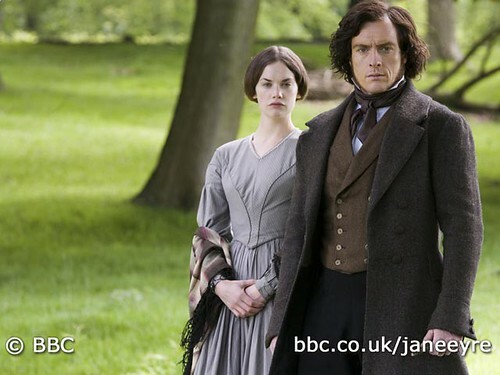 I coincidentally watched a mini series of BBC drama called “Jane Eyre” which was on PBS. Jane Eyre is a novel written by Charlotte Bronte in England. Due to a mean aunt, Jane Eyre became an orphan. To be independent, she studied hard to be a teacher and she was employed by a rich house as a private teacher. This drama is a love story between the house’s master, Rochester and Jane Eyre. According to Wikipedia, at the time when this novel was published in 1847, this novel deviated from other novels – for example, the heroine was not conventionally beautiful and she was independent having her own profession. She was conscious of gender equality and although it was men who claimed love to women at that time, she confessed love from her and chose her man freely. I live in this modern era and I was so excited to watch this drama. I imagine it must had been so sensational for the women who read this novel at that time. Toby Stephens who acted Mr. Rochester is an English actor and his parents are both big actors, Robert Stephens and Maggie Smith. He was not very good in 007 as a baddy but he is super duper handsome in this drama. He made a good combination with Ruth Wilson who acted Jane Eyre. I asked my sister in law in England if she watched this drama. She said, “I watched it three times!” I’d love to watch it three times and this is a kind of drama you can watch three times. I made this page where you can watch the drama through youtube. The below is one of my favourite scenes. I was screaming with excitement during this scene.